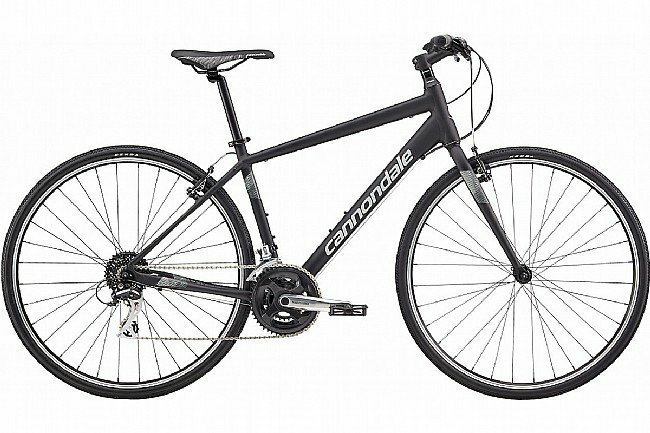 Cannondale’s 2018 Quick 7 Hybrid Bike features a lightweight SmartForm C3 Alloy frame, SAVE technology, and a balance of upright and forward-leaning geometry that yields a comfortable, stable, and responsive ride suited for both commuting and shredding. Frame Material: SmartForm C3 Alloy, SAVE, 1-1/8" headtube. Fork: Quick, Cromoly, 1-1/8" steerer. Shifters: Shimano EF51, EZ-Fire, 3x8. Rear Derailleur: Shimano Acera, 8-speed. Cassette: Shimano HG-31 11-32, 8-speed. Brakeset: Cannondale Mini V, cartridge pads. Handlebar: Cannondale C4, 6061 alloy, 20mm rise,10° sweep, 640mm. Stem: Cannondale, 6061 alloy, 31.8, 12°. Saddle: Cannondale Fitness Ergo . Rims: Cannondale C4, double wall, 32-hole. Hubs: Alloy, sealed, loose ball bearings, QR, 32h. Tires: Kenda K192, 700 x 35c.